Everybody knows that there’s no love quite like puppy love. Puppies are trusting, loving, joyous, affectionate, playful, full of life, energy, and adventure. Puppies love to run, splash around in mud puddles, and play with other puppies and any human who will give them a few moments of their time and attention. Puppies remind us to enjoy the moment, show enthusiasm about life in general, and take time to cuddle with those we love. March 23rd is National Puppy Day in the U.S. Established in 2006, National Puppy Day is actually considered an international holiday now, as it has trended worldwide on Twitter in 2012, 2013. 2014 and 2015. According to their website, National Puppy Day is a special day to celebrate the magic and unconditional love that puppies bring to our lives. The website encourages the public to adopt a puppy rather than shop for one at a pet store, to help discourage commercial breeders, often known as puppy mills. The organization encourages would-be pet owners to always consider adoption first and remember the importance of spaying and neutering dogs (and cats) to reduce the overpopulation of unwanted pets and unnecessary suffering. What sort of lessons can be learned from having a puppy? Having a puppy teaches us a lot about life. Children can learn how to care for someone else’s needs when they’re given responsibilities that come along with owning a pet, such as remembering to feed, exercise, and play with the puppy daily. Children can also enjoy the benefits of having a loyal companion when there’s a puppy in the house and discover how a reciprocal relationship works. 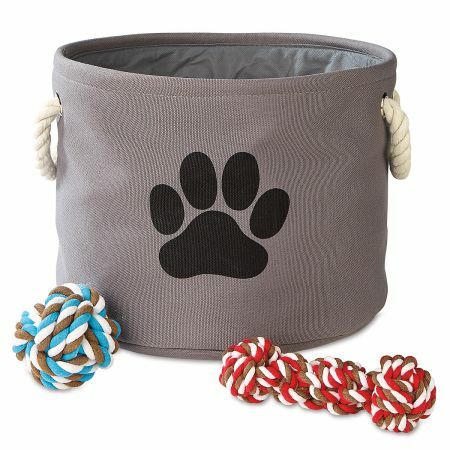 If you have a new puppy in your household, you may need a pet toy bin and a chair protector for those puppy slobbers (and minor accidents). This is another responsibility your kids can learn – how to pick up after the puppy and put things away when they’re done playing. To celebrate your fur baby, you might want to pick up a decorative sign that expresses how you feel about your four-footed friend, a paw print welcome mat for your front door, or an embossed blanket the two of you can cuddle with. No matter how you choose to celebrate National Puppy Day this year, remember that your pet needs you every day, and the love you show your puppy will come back to you in leaps and bounds…literally!